Creative experiences abound! Seeing the excellent works of others inspires creative exploration . . . This is really a remarkable collection of art when you consider these are sketches and drawings done in the artist's sketch books. Here, Can you believe this is someone's moleskin? Paule Trudel Bellemare's Portfolio is really quite fresh, and deserves a look from the art direction community! 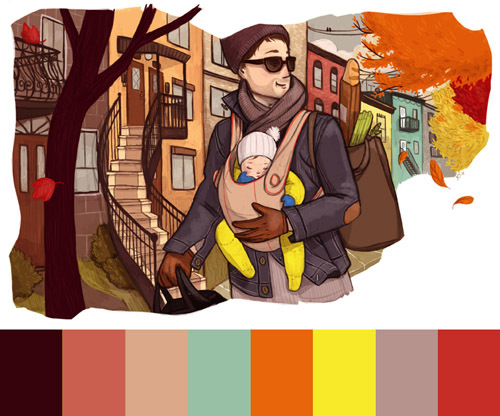 These are eye-pleasing, carefully planned color palettes. Paule is now freelancing as a fashion and children illustrator in Montreal, Quebec, Canada. Natalie Shau is illustrator and photographer of Russian and Kazakhstan descent based in Lithuania (Vilnius). She works mainly in digital media and Natalie's works are mixture of her photography, digital painting and 3D elements. August Heffner, writes . . .
My teenage years ended abruptly at the turn of the century. This means I was born the year MTV went on the air and my entire teenage years were spent in the 1990s. It's no wonder that upon leaving college as an official graphic designer, I was at odds with the decades I was reared in. I hated all of the styles I'd known. I hated the '80s. I hated Memphis. I hated April Greiman posters. I hated Neville Brody. I hated the '90s. I hated Raygun. I hated Emigre. CAUTION: this is a slow loader and employs stalker links! Threshold Furniture & Design is a 8 person, high-end European furniture & accessories store, as well as an interior design studio. "I project a child's drawing with an opaque projector, faithfully tracing each line. Applying a combination of logic and instinct, I then paint the image as realistically as I can." Full story : Created by Vimeo for its Vimeo Video School.